Holiday desserts are among my favorite reasons for going to the blizzard of parties and gatherings this time of year. One that I always find myself drawn to: Rocky Road fudge. While I adore fudge in its original form, for this dessert, I wanted to combine those flavors with the form of another favorite year-round treat: peanut butter cups. I also wanted to create a make-ahead dessert so that there wasn't a last minute scramble before hosting or party-going. The result is a tasty little sweet treat that's a perfect party pick-up. 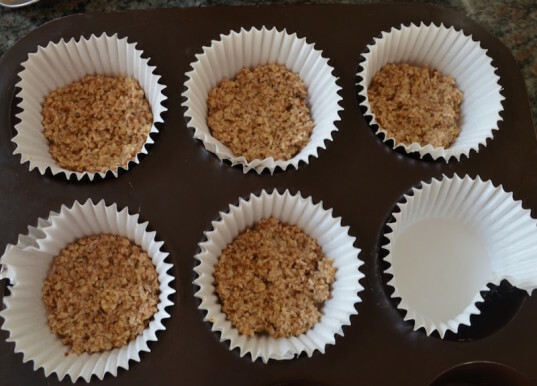 You can make them using full-size cupcake liners or turn them into two-bite yummies using a mini cupcake baking tray. I wanted a mix of both mini and regular size cups, and I was able to make 10 regular size and a dozen mini cups from this recipe. 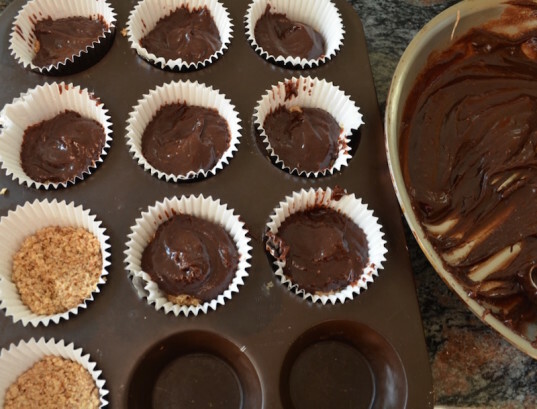 If you are making all of of one size, the recipe will yield 13-15 regular size fudge cups or about 3 dozen minis. 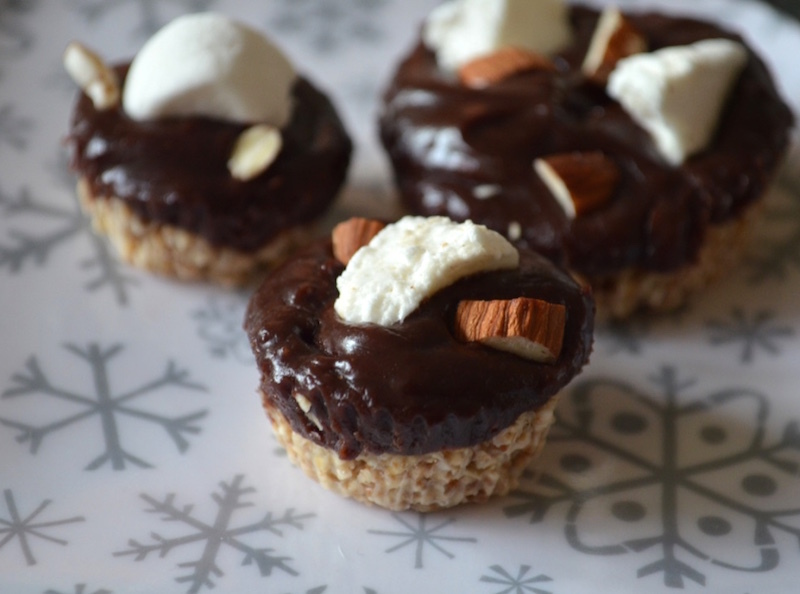 With 15 minutes or less of active "cooking" time and ingredients that most holiday pantries already have lying around, this is a holiday dessert both kids and kids-at-heart will find themselves reaching for. This recipe is extremely easy to size up or down, so these fudge cups are a fun treat to have on hand for adults-only after the kids go to bed or for an impromptu family movie night. You can freeze the Rocky Road fudge cups as well for a week or so -- just thaw them in the fridge for a few hours beforehand so that the marshmallows aren't tough. marshmallows (mini or regular size), as many as needed. I used Dandies. 2. Make the bottom crust. Prepare your cupcake tins by placing liners in them. If you prefer to go without liners, you can grease the insides with coconut oil. In a food processor, add the rolled oats. Pulse until well-chopped then add the coconut butter and sugar, starting with just 2 Tbsp of sugar. Process until a “dough” forms that sticks together when pinched. Taste and add additional sugar as needed. Process again if necessary then drop about 3/4 tablespoon of the crust into the prepared liners if using full size cupcakes or slightly less than 1 teaspoon if making minis. Press the mixture gently into the liners. The coconut butter will solidify further while chilling, bringing the crust together even more. Place the filled cupcake pan(s) in the fridge while preparing the rest of the recipe. 3. Melt the chocolate chips and milk. Place the chocolate chips and the milk in a medium saucepan over medium-low heat to melt. 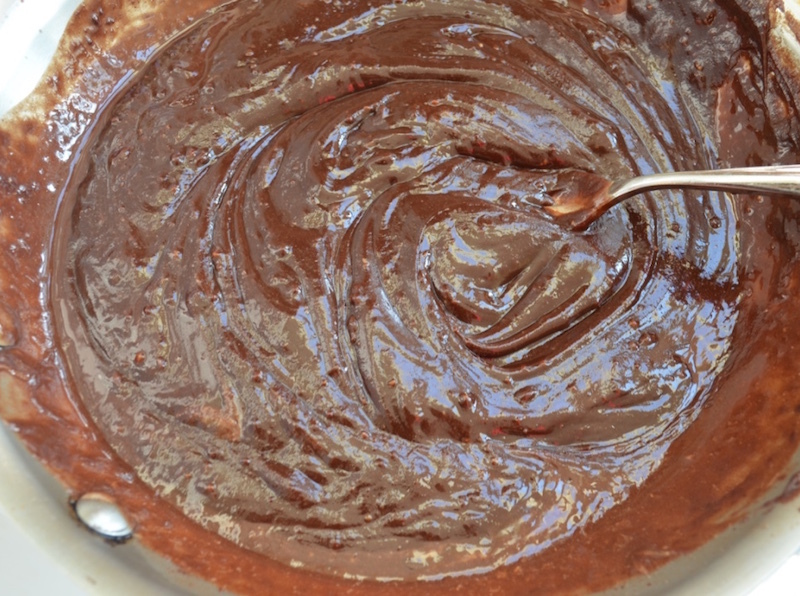 Proceed to step 4 while the mixture is heating up. Once the chocolate begins to melt, stir the chips and milk together until combined, then add the almond butter and whisk or stir until you have a creamy, shiny, chocolate-y mixture. Remove from the heat. 4. 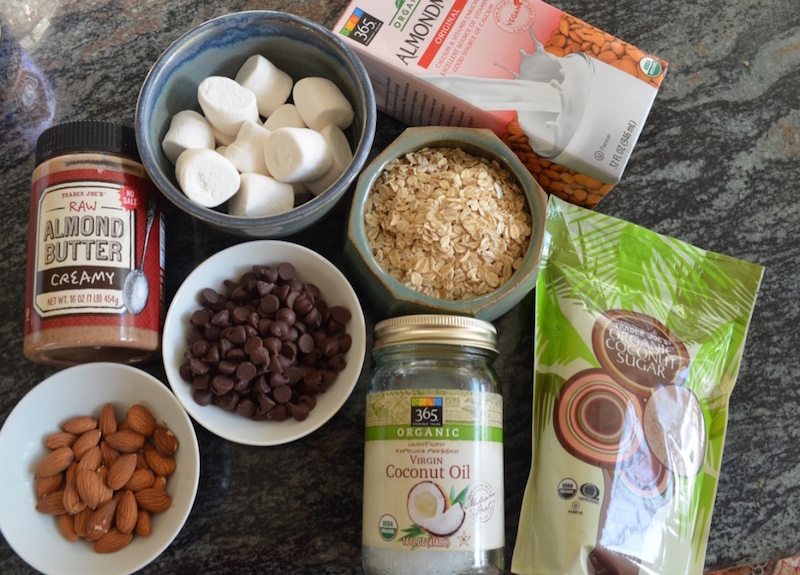 Chop the marshmallows and almonds. While the fudge-y filling is heating up, chop your marshmallows and almonds. If you want to save time, purchase mini marshmallows and pre-sliced or chopped almonds. I used regular sized marshmallows and chopped each into halves, and then each half into thirds. I like chunks of almonds, so I chopped those into thirds as well. My son isn’t a fan of nutty deserts, so I made a few cups with just marshmallows in them. Remove the cupcake pans from the fridge and fill the cups with the fudge filling. I used about 1 1/2 tablespoons of filling for the regular size cups and about 2 teaspoons for the minis. I filled the mini cupcakes almost to the top, but the regular size cups only about 1/3-1/2 full since the dessert is pretty rich and decadent. 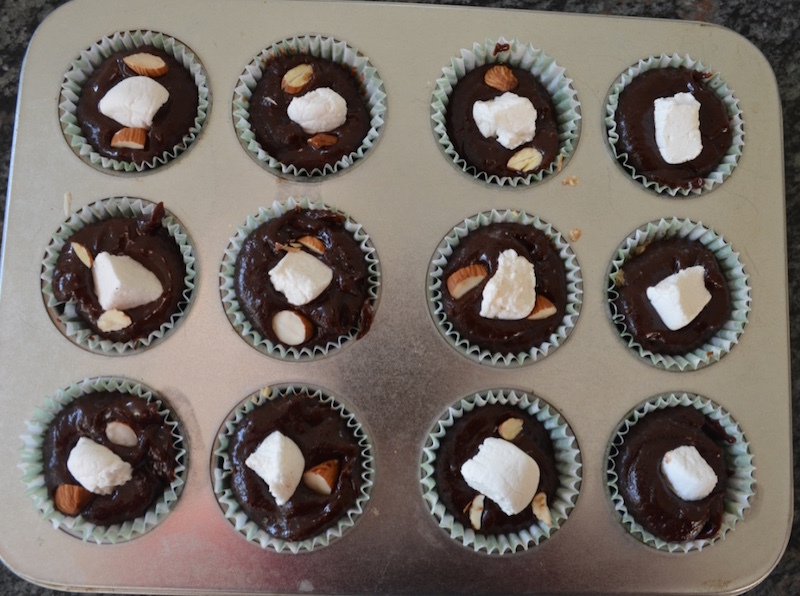 Add a few chopped or sliced almonds and marshmallows to the cups, pressing gently to embed them in the surface. Place the finished cups in the fridge for at least an hour or two to firm up. Serve when ready! If you are making these ahead of a party, after a few hours of chilling, place them in an airtight covered container. The cups can be stored this way for several days. If they have been chilled for a while, about five minutes before you are ready to serve them, take the cups out of the fridge and let them sit at room temperature to soften slightly. If you prefer a firmer, chewier texture, you can serve them straight out of the fridge. Happy holidays! Prepare your cupcake tins by placing liners in them. If you prefer to go without liners, you can grease the insides with coconut oil. In a food processor, add the rolled oats. Pulse until well-chopped then add the coconut butter and sugar, starting with just 2 Tbsp of sugar. Process until a "dough" forms that sticks together when pinched. Taste and add additional sugar as needed. Process again if necessary then drop about 3/4 tablespoon of the crust into the prepared liners if using full size cupcakes or slightly less than 1 teaspoon if making minis. Press the mixture gently into the liners. The coconut butter will solidify further while chilling, bringing the crust together even more. Place the filled cupcake pan(s) in the fridge while preparing the rest of the recipe. 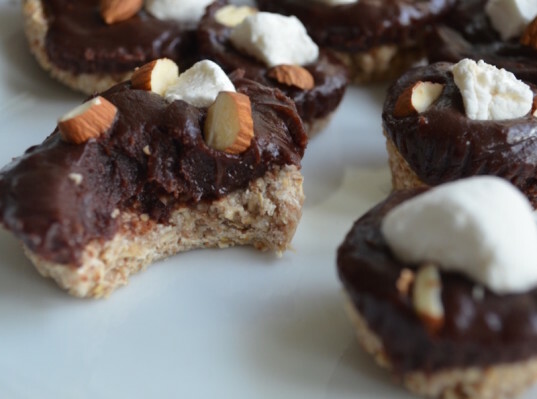 While the fudge-y filling is heating up, chop your marshmallows and almonds. 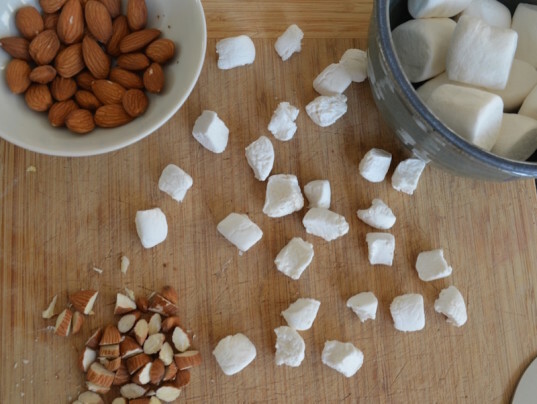 If you want to save time, purchase mini marshmallows and pre-sliced or chopped almonds. I used regular sized marshmallows and chopped each into halves, and then each half into thirds. I like chunks of almonds, so I chopped those into thirds as well. My son isn't a fan of nutty deserts, so I made a few cups with just marshmallows in them.